Coca-Cola plans to cut 1,200 jobs as it deepens its cost-cutting initiatives in response to sluggish soda sales, the company said Tuesday. The maker of Sprite and Fanta announced the job cuts as it reported lower second-quarter profits due to restructuring costs and flat sales amid efforts to tout new low-sugar beverages in response to flagging demand for soda. The job cuts account for about one percent of the soda giant's 100,300 employees. Coca-Cola said it also is expanding its cost-cutting program to reach $800/£623 million annually by 2019. While the job cuts "will clearly be difficult for those impacted, these changes are critical for us to create an environment where we can accelerate growth and become the consumer-centric, total beverage company we need to be in a fast-changing world," incoming chief executive James Quincey said in a statement. Net income in the first quarter plunged to $1.2/£1 billion, down 20.3 percent from the year-ago period. Revenues fell 11.3 percent to $9.1£7 billion, reflecting lower sales from bottlers that were sold to franchisees as part of a corporate reorganization. One-time costs associated with the bottling refranchising also dented earnings. Volumes were flat globally, including in North America, the biggest region by revenue, and fell three percent in Latin America due to weakness in Brazil and Venezuela. Coca-Cola aims to deliver a "more consumer-centric portfolio that meets people's changing tastes and preferences," said Quincey, who will become chief executive next month. New product offerings include "Honest Sport," a sports drink that is an offshoot of the low-sugar Honest Tea. The company also is launching Coca-Cola Plus in Japan, a no-sugar drink with dietary fiber aimed at Japan's large aging population. 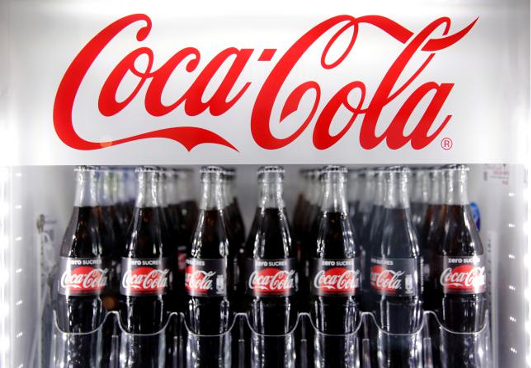 Coca-Cola shares dipped 0.2 percent to $43.19/£33 in afternoon trading.